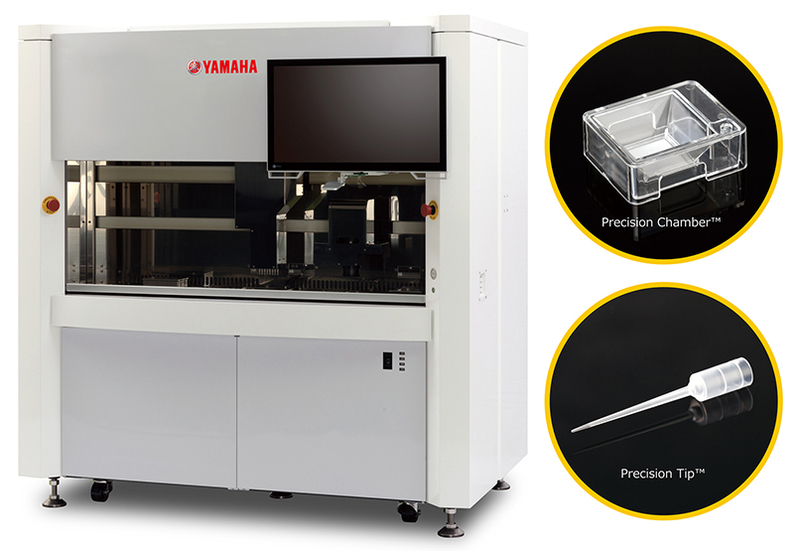 - Company’s First Appearance at Lab Automation and Screening International Exhibition - Yamaha Motor to Exhibit CELL HANDLER Cell Picking/Imaging System at SLAS2018 - New Expansion of Application to Picking of iPS Cells and Cells Cultured in Gels - - News Releases | Yamaha Motor Co., Ltd.
IWATA, February 1, 2018—Yamaha Motor Co., Ltd. (Tokyo:7272) announced today that it will exhibit the CELL HANDLERTM cell* picking and imaging system at the SLAS2018 (Society for Laboratory Automation and Screening) to be held from February 3 to 7 in San Diego, California. Aimed at specialists in the fields of clinical testing and preclinical research such as pharmaceutical drug discovery, the SLAS2018 is an international exhibition featuring research presentations and forums dedicated to laboratory automation and drug candidate screening. In 2017, the event featured approximately 300 corporate exhibitions and was attended by nearly 5,000 visitors. The CELL HANDLER provides an innovative high speed and high precision platform for automated cell selection, picking, and imaging to replace the conventional manual method. Its range of applications was recently expanded and now enables selecting and picking iPS cells, transfected single cells, and furthermore, can efficiently, rapidly and accurately pick target spheroids/organoids cultured in gels. In addition to displaying the CELL HANDLER, Yamaha Motor will also provide an “AI Experience” at the SLAS2018. Visitors can experience in a hands-on manner the process in which the CELL HANDLER learns which cells to pick using artificial intelligence (AI). Presentations are also planned to introduce examples of joint research on cancer biomarkers, and applications of the CELL HANDLER. The latter will be presented by Ron de Jong, PhD, who has led cell screening groups in multiple biotechnology and pharmaceutical companies. Showcasing the CELL HANDLER, which enables high-throughput screening and testing of single cell and multicellular aggregates, will attract many specialist visitors at the SLAS2018. Yamaha Motor aims to spread awareness of the CELL HANDLER, and contribute to the development of therapeutic drugs, as well as the acceleration of precision medicine and cost reduction of developing future medicines. *In this release "cell" refers to a single cell and/or aggregated cells including spheroid and organoid.